Doris had a big hit back in 1958 with the song, “Everybody Loves a Lover,” written by Robert Allen and Richard Adler. Now, almost 60 years later, multi-talented performer Scott Dreier has turned it into a fun, new duet with Grammy®-nominated recording artist Jane Monheit. I’m honored by this tribute and thrilled that Scott is releasing “Everybody Loves a Lover” in advance of his album The Doris Day Project, due out in January. And guess what? 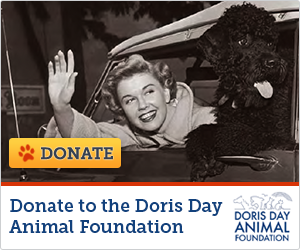 You can click here to download the single “Everybody Loves a Lover,” exclusively through the Doris Day Animal Foundation website, with all proceeds benefiting DDAF. For just a $5 donation, you can be among the first to hear this delightful new duet and help the precious four-leggers at the same time. Remember, you can only get it here!